All these multiverse ideas lead to a remarkable synthesis between cosmology and physics...But they also lead to the extraordinary consequence that we may not be the deepest reality, we may be a simulation. The possibility that we are creations of some supreme, or super-being, blurs the boundary between physics and idealist philosophy, between the natural and the supernatural, and between the relation of mind and multiverse and the possibility that we're in the matrix rather than the physics itself. Cosmology and astrophysics are branches of physics in which one needs an unusual combination of breadth and depth to excel. Martin Rees is arguably the finest all-round theoretical physicist working today. I do not always agree with him—especially in areas outside physics itself—but I always want to know his opinion. As does every wise person. I have known and admired Martin Rees since the early 1970's when we were postdocs together at Cambridge University. Even at that stage Martin's extraordinary breadth of knowledge and expertise were apparent. Pick almost any topic in astronomy or physics, and he would have a carefully evaluated position worked out. He is one of only a few great scientists who is both open-minded and healthily-skeptical. At a time in his career when he could justifiably rest on his laurels, Martin Rees is as energetic and active as ever, offering stunning insights into many emerging scientific fields. 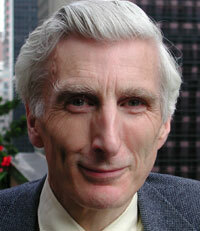 Martin Rees one of the most influential people working in astrophysical and cosmological theory. He is simultaneously open to new ideas and suggestions and careful and rigorous in his response and criticisms. Also, it's difficult to suggest an idea about the evolution of structure in the universe or the formation of the galaxies that he hasn't thought of or played with or perhaps even written about at some time. Much of the credit for what I like to think of as the discovery that the laws of nature are special in ways that allow the universe to be very structured is due to him. Martin Rees is my favorite theoretical astrophysicist. He is not only incredibly knowledgeable, but he is also wonderfully helpful to his colleagues. He has contributed over 500 papers to the scientific literature, making important contributions to almost every aspect of astrophysics. He is especially well-known for his work on galaxy formation and the theory of cold dark matter, and also for his work on active galactic nuclei and the black holes that are believed to drive them. SIR MARTIN REES is Royal Society Professor at Cambridge University, Fellow of King's College, the UK's Astronomer Royal, and a Fellow of the Royal Society. He was previously Plumian Professor of Astronomy and Experimental Philosophy at Cambridge, having been elected to this chair at the age of thirty, succeeding Fred Hoyle. He has originated many key cosmological ideas: for example, he was the first to suggest that the fantastically energetic cores of quasars may be powered by giant black holes. For the last twenty years, he has directed a wide-ranging research program at Cambridge's Institute of Astronomy. He is the author of several books, including Gravity's Fatal Attraction (with Mitchell Begelman); New Perspectives in Astrophysical Astronomy; Before the Beginning: Our Universe and Others; Just Six Numbers: The Deep Forces that Shape the Universe; Our Cosmic Habitat; and Our Final Hour: A Scientist's Warning: How Terror, Error, and Environmental Disaster Threaten Humankind's Future in this Century—on Earth and Beyond (published in the UK as Our Final Century: The 50/50 Threat to Humanity's Survival). (MARTIN REES:) This is a really good time to be a cosmologist, because in the last few years some of the questions we've been addressing for decades have come into focus. For instance, we can now say what the main ingredients of the universe are: it's made of 4% atoms, about 25% dark matter, and 71% mysterious dark energy latent in empty space. That's settled a question that we've wondered about, certainly the entire 35 years I've been doing cosmology. We also know the shape of space. The universe is 'flat'—in the technical sense that the angles of even very large triangles add up to 180 degrees. This is an important result that we couldn't have stated with confidence two years ago. So a certain phase in cosmology is now over. But as in all of science, when you make an advance, you bring a new set of questions into focus. And there are really two quite separate sets of questions that we are now focusing on. One set of questions addresses the more 'environmental' side of the subject—we're trying to understand how, from an initial Big Bang nearly 14 billion years ago, the universe has transformed itself into the immensely complex cosmos we see around us, of stars and galaxies, etc. ; how around some of those stars and planets arose; and how on at least one planet, around at least one star, a biological process got going, and led to atoms assembling into creatures like ourselves, able to wonder about it all. That's an unending quest—to understand how the simplicity led to complexity. To answer it requires ever more computer modeling, and data in all wavebands from ever more sensitive telescopes. • Why is the universe expanding the way it is? • Why does it have the rather arbitrary mix of ingredients? • Why is it governed by the particular set of laws which seem to prevail in it, and which physicists study? These are issues where we can now offer a rather surprising new perspective. The traditional idea has been that the laws of nature are somehow unique; they're given, and are 'there' in a platonic sense independent of the universe which somehow originates and follows those laws. I've been puzzled for a long time about why the laws of nature are set up in such a way that they allow complexity. That's an enigma because we can easily imagine laws of nature which weren't all that different from the ones we observe, but which would have led to a rather boring universe—laws which led to a universe containing dark matter and no atoms; laws where you perhaps had hydrogen atoms but nothing more complicated, and therefore no chemistry; laws where there was no gravity, or a universe where gravity was so strong that it crushed everything; or the lifetime was so short that there was no time for evolution. It always seemed to me a mystery why the universe was, as it were, 'biophilic'—why it had laws that allowed this amount of complexity. To give an analogy from mathematics, think of the Mandelbrot Set; there's a fairly simple formula, a simple recipe that you can write down, which describes this amazingly complicated pattern, with layer upon layer of structure. Now you could also write down other rather similar-looking recipes, similar algorithms, which describe a rather boring pattern. What has always seemed to me a mystery is why the recipe, or code, that determined our universe had these rich consequences, just as the algorithms of the Mandelbrot set rather than describing something rather boring, in which nothing as complicated as us could exist. For about 20 years I've suspected that the answer to this question is that perhaps our universe isn't unique. Perhaps, even, the laws are not unique. Perhaps there were many Big Bangs which expanded in different ways, governed by different laws, and we are just in the one that has the right conditions. This thought in some respect parallels the way our concept of planets and planetary systems has changed. People used to wonder: why is the earth in this rather special orbit around this rather special star, which allows water to exist or allows life to evolve? It looks somehow fine-tuned. We now perceive nothing remarkable in this, because we know that there are millions of stars with retinues of planets around them: among that huge number there are bound to be some that have the conditions right for life. We just happen to live on one of that small subset. So there's no mystery about the fine-tuned nature of the earth's orbit; it's just that life evolved on one of millions of planets where things were right. It now seems an attractive idea that our Big Bang is just one of many: just as our earth is a planet that happens to have the right conditions for life, among the many many planets that exist, so our universe, and our Big Bang, is the one out of many which happens to allow life to emerge, to allow complexity. This was originally just a conjecture, motivated by a wish to explain the apparent fine-tuning in our universe—and incidentally a way to undercut the so-called theological design argument, which said that there was something special about these laws. But what's happened in the last few years, and particularly sin the last year, is that the basis for this so-called multiverse idea has strengthened, and, moreover, the scale which we envisage for the multiverse has got even vaster than we had in mind a few years ago. There's a firmer basis for the 'multiverse' concept because recent work on the best theory we have for the fundamental laws of nature, namely superstring theory, suggests that there should indeed be many possible forms for a universe, and many possible laws of nature. At first it was thought that there might be just one unique solution to the equations, just one possible three-dimensional universe with one possible 'vacuum state' and one set of laws. But it seems now, according to the experts, that there could be a huge number. In fact Lenny Susskind claims that there could be more possible types of universe than there are atoms in our universe—a quite colossal variety. The system of universes could be even more intricate and complex than the biosphere of our planet. This really is a mind-blowing concept, especially when we bear in mind that each of those universes could themselves be infinite. At first sight you might get worried about an infinity of things in themselves infinite, but to deal with this you have to draw on a body of mathematics called transfinite number theory, that goes back to Cantor in the 19th century. Just as many kinds of pure mathematics have already been taken over by physicists, this rather arcane subject of transfinite numbers is now becoming relevant, because we've got to think of infinities of infinity. Indeed, there's perhaps even a higher hierarchy of infinities: in addition to our universe being infinite, and there being an infinite number of possible laws of nature, we may want to incorporate the so-called many worlds theory of quantum mechanics. Each 'classical' universe is then replaced by an infinite number of super-imposed universes, so that when there's a quantum choice to be made the path forks into extra universes. This immensely complicated construct is the consequence of ideas that are still speculative but are firming up. One of the most exciting frontiers of 21st century physics, is to utilize the new mathematics and the new cosmology to come to terms with all this. What we've traditionally called 'our universe' is just a tiny part of something which is infinite, so allows for many replicas of us elsewhere (in our same space-time domain, but far beyond the horizon of our observations), but even that infinite universe is just one element of an ensemble that encompasses an infinity of quite different universes. So that's the pattern adumbrated by cosmology and some versions of string theory. What we have normally called the laws of nature are not universal laws—they're just parochial by-laws in our cosmic patch, no more than that, and a variety of quite different regimes prevail elsewhere in the ensemble. One thing which struck me recently, and I found it a really disconcerting concept, was that once we accept all that, we get into a very deep set of questions about the nature of physical reality. That's because even in our universe, and certainly in some of the others, there'd be the potential for life to develop far beyond the level it's reached on earth today. We are probably not the culmination of evolution on earth; the time lying ahead for the earth is as long as the time it's elapsed to get from single-celled organisms to us, and so life could spread in a post-human phase far beyond the earth. In other universes there may be an even richer potentiality for life and complexity. Now life and complexity means information-processing power; the most complex conceivable entities may not be organic life, but some sort of hyper-computers. But once you accept that our universe, or even other universes, may allow the emergence within them of immense complexity, far beyond our human brains, far beyond the kind of computers we can conceive, perhaps almost at the level of the limits that Seth Lloyd discusses for computers—then you get a rather extraordinary conclusion. These super or hyper-computers would have the capacity to simulate not just a simple part of reality, but a large fraction of an entire universe. And then of course the question arises: if these simulations exist in far larger numbers than the universe themselves, could we be in one of them? Could we ourselves not be part of what we think of as bedrock physical reality? Could we be ideas in the mind of some supreme being, as it were, who's running a simulation? Indeed, if the simulations outnumber the universes, as they would if one universe contained many computers making many simulations, then the likelihood is that we are 'artificial life' in this sense. This concept opens up the possibility of a new kind of 'virtual time travel', because the advanced beings creating the simulation can, in effect, rerun the past. It's not a time-loop in a traditional sense: it's a reconstruction of the past, allowing advanced beings to explore their history. Once you accept the idea of the multiverse, and that some universes will have immense potentiality for complexity, it's a logical consequence that in some of those universes there will be the potential to simulate parts of themselves, and you may get sort of infinite regress, so we don't know where reality stops and where the minds and ideas take over, and we don't know what our place is in this grand ensemble of universes and simulated universes. Considerations of the multiverse change the way we think about ourselves and our place in the world. Traditional religion is far too blinkered to encompass the complexities of mind and cosmos. All we can expect is to have a very incomplete and metaphorical view of this deep reality. The gulf between mind and matter is something we don't understand at all, and some minds can evolve to the stage that they can create other minds, there's real blurring between the natural and the supernatural. I am concerned about the threats and opportunities posed by 21st century science, and how to react to them. There are some intractable risks stemming from science, which we have to accept as the downside for our intellectual exhilaration and—even more—for its immense and ever more pervasive societal benefits. I believe there is an expectation of a 50% chance of a really severe setback to civilization by the end of the century. Some people have said that's unduly pessimistic. But I don't think it is: even if you just consider the nuclear threat, I think that's a reasonable expectation. If we look back over the cold war era, we know we escaped devastation, but at the time of the Cuba crisis, as recent reminiscences of its 40th anniversary have revealed, we were really on a hair trigger, and it was only through the responsibility and good sense of Kennedy and Khrushchev and their advisers that we avoided catastrophe. Ditto on one or two other occasions during the cold war. And that could indeed have been a catastrophe. The nuclear arsenals of the superpowers have the explosive equivalent of one of the US Air Force's s daisy cutter bombs for each inhabitant of the United States and Europe. Utter devastation would have resulted had this all gone off. The threat obviously abated at the end of the cold war, but looking a century ahead, we can't expect the present political assignments to stay constant. In the last century the Soviet Union appeared and disappeared, there were two world wars. Within the next hundred years, since nuclear weapons can't be disinvented, there's quite a high expectation, there will be another standoff as fearsome as the cold war era, perhaps involving more participants than just two and therefore be more unstable. Even if you consider the nuclear threat alone, then there is a severe chance, perhaps a 50% chance, of some catastrophic setback to civilization. There are other novel threats as well. Not only will technical change be faster in this century than before, but it will take place in more dimensions. Up to now, one of the fixed features over all recorded history has been human nature and human physique; human beings themselves haven't changed, even though our environment and technology has. In this century, human beings are going to change because of genetic engineering, because of targeted drugs, perhaps even because of implants into their brain to increase our mental capacity. Much that now seems science fiction might, a century ahead, become science fact. Fundamental changes like that—plus the runaway development of biotech, possibly nanotechnology, possibly computers reaching superhuman intelligence—open up exciting prospects, but also all kinds of potential scenarios for societal disruption—even for devastation. We have to be very circumspect if we are to absorb these rapid developments without a severe disruption. In the near term the most severe threat stems from developments in biotechnology, and genetic engineering. An authoritative report just last year by the National Academy of Sciences, emphasized that large numbers of people would acquire the capability to engineer modified viruses to which existing vaccines might be ineffective, and thereby trigger some sort of epidemic. The scary realization is that to do this would not require a large terrorist group, certainly not rogue states, but just by an individual with the same mind set as an arsonist. Such people might start hacking real viruses. If an epidemic ensued, it probably could be contained in this country, but as the SARS episode shows, infections rapidly spread around the world, and if any of these epidemics reach the mega-cities of the third world then they could really take off. I took a public bet—one of the 'long bets' set up by Wired Magazine—that within 20 years one instance of bio error or bio terror would lead to a million fatalities. That's not unduly pessimistic: it would require just one weirdo to release a virus that spread into the third world. That's a scarifying possibility, rendered possible by technology that we know is going to become available. And it's difficult to control as the kind of equipment that's needed is small-scale. Also, it's the kind of technology which is utilized for all kinds of benign purposes anyway and is bound to exist unless we entirely stop drug developments and other bio-technology. I can foresee what might happen if there were one such event like this that happened in the United States. Supposing that there were a mysterious epidemic which maybe didn't kill a huge number of people, but which could be traced to some engineered virus, maliciously or erroneously released. Everyone would realize that if this happened once it could happen again, any time, anywhere. And they'd realize also that the only way to stop a repeat would be to have intrusive surveillance to keep tabs on everyone who had that expertise. There would be real pressure to infringe on basic freedoms, and a strong anti-science backlash, if one event like this happened. That's the near-term danger which I worry about most. Being a cosmologist doesn't make me worry less than anyone else about what happens tomorrow or next week or next year. But it does give a different perspective, because cosmologists are aware of the long-term future. Most educated people are now aware that we as humans are the outcome of billions of years of evolution. Almost four billion years of Darwinian selection, separate us from the very first microorganisms. But most people nonetheless, at least subconsciously, feel that we as humans are a kind of culmination—that evolution led to us and that's that. But, anyone who's studied astronomy knows that the sun is less than halfway through its life, and the universe may have an infinite future. So the time lying ahead, for evolution, is at least as long as the time elapsed up to now: the post-human phase of evolution could be at least as long as what has led from single-celled organisms to humans, and of course you only have to read science fiction to realize the scenarios whereby life can evolve here on the earth in more elaborate ways, and, more likely, can spread beyond the earth; life from the earth could even 'green' the entire galaxy, if given enough time. And that time does exist. As a cosmologist I'm more aware of the immensely long-term potential that we'd be foreclosing if we screwed things up here on earth this century. This perspective gives us an extra motive for cherishing this pale blue dot in the cosmos, because of the importance it might for the long-range future of life even beyond the earth. I've been in cosmology for 35 years now, and what has been a tremendous boost to my morale is that the pace of discovery has not slowed up at all. The 1960s seemed an exciting time. That's when the first evidence for the Big Bang appeared. It's also when the first high red shift quasars were discovered, along with the first evidence of black holes, neutron stars, etc. It was good to be a young cosmologist, because when everything's new, the experience of the old guys is at a discount and all had to start afresh. But what's happened in the last three or four years is just as exciting as in any previous period that I can remember. In cosmology we have not only lots of fascinating ideas about how the universe began, ideas of how complexity developed, the possibility of extra dimensions playing a role, etc. But we also have new evidence which pins down some of the key numbers of the universe. We know we live in a flat universe where the atoms that make up us, the stars, the planets and the galaxies constitute only 4% of the mass and energy. About 25% is in mysterious dark matter, which helps with the gravitational binding of galaxies. And the remainder, 71%, is even more mysterious; some kind of energy latent in empty space itself. To explain dark matter is a challenge to physicists: it's probably some kind of particle left over from the Big Bang. To explain dark energy is even more daunting: superstring theorists believe it is the biggest challenge to their theory, because it tells us that the empty space we live in, our "vacuum," is something which isn't just nondescript; it has a well-defined energy, a well-defined tension in it, which affects the overall cosmic dynamics, causing an acceleration of the Hubble expansion. Another important advance has been in understanding the emergence of structure within the universe. To put this in context, let's imagine how the universe evolved. It started off as a very hot fireball. As it expanded it cooled down; the radiation diluted and its wavelengths stretched. After about half a million years the universe literally entered a dark age, because instead of glowing bright and blue the primordial heat, the heat of the fireball, then shifted into the infrared, and the universe became literally dark. This dark age continued until the first stars formed and lit it up again. One of my long-standing interests has been trying to understand when and how this happened. We've had some new clues recently from observations using giant ground-based telescopes, from the WMAP satellite, and also from being able to do computer simulations of how the first structures formed. We are trying to combine theories and observations to understand the formative stages of galaxies—how the first stars formed, in units much smaller than galaxies, then they assembled together to make galaxies, and how simple atoms of hydrogen and helium gradually get transmuted in early generations of stars into carbon, oxygen, silicon, and iron, the building blocks of planets and then of life. We need to understand how long it took to get the first planets, how long it took to get the first potentiality of life, how long to get the first big galaxies from these small precursor substructures. More clues are coming from observations using the most powerful telescopes we now have—the biggest of all is the European very large telescope in Chile, which is really four telescopes, each with 8 meter mirrors, that can be linked together. These huge mirrors allow us to detect very faint and distant objects. The further out you look in space the further back you look in time. The goal is to look back far enough to actually see galaxies in their formative stages—even perhaps to see pregalactic eras when the first stars were formed. That's a possibility that arises from another of my main interests, which is the most powerful explosion in the universe—gamma ray bursts. These represent the violent end of a particular kind of supernova explosion. They're so powerful that they could be readily detected, even from the era when the very first stars were born. If some of these very first stars end their lives as gamma ray bursts, then we can use them to probe the earliest phases of galaxy formation—how the dark age ended and how the structures gradually built up. Big telescopes will offer snapshots of what the universe was like at various stages in the past. There have been these amazing developments of the structure of the universe. But if I was asked to think of what else has been exciting in astronomy recently, the undoubted other highlight has been the discovery of large numbers of planets around other stars. Only in 1995 did astronomers find the first evidence for a planet orbiting another star like the sun. Now there are more than a hundred, and there's every expectation that a large proportion of the stars you can see in the sky have retinues of planets orbiting them. Ten or 20 years from now, looking up at the sky will be a more interesting experience, because the stars won't just be twinkling points of light, but for each of them we'll be able to say something about the planets it has orbiting around it, their masses, their orbits, and perhaps the topographical features of the largest planets. That will make the night sky a lot more interesting and make everyone appreciate the universe as a much more rich and diverse place. Most of those planets will be inhospitable to life, but astronomers will have found planets which are rather like the earth. And that will give a focus for addressing the questions of life in the universe. We will be able to analyze the light from these earth-like planets, and test whether there is for instance ozone in its atmosphere which would be a signal for biological processes. And that would give us a clue as to whether there might be life. This enterprise will be complemented by progress by biologists in understanding the origin of life on earth—by experiments and perhaps also computer simulations. I'm very hopeful that 20 years from now we'll understand the origin of life; we'll have a feel for whether life is widespread in the universe; we might be able to point to particular other planets, orbiting other stars that might have life on them. There is then a rather separate question: whether simple life is likely to evolve into anything we might recognize as intelligent or complex. That may be harder to decide. Some people say that there are many hurdles to be surmounted in going from simple life to complex life, and life on earth is lucky to surmount those hurdles but others suspect that life would somehow find its way to great complexity. Among my friends and colleagues there's a disparity of belief. As an astronomer, I'm often asked: isn't it a bit presumptuous to try to say anything with any level of confidence about these vast galaxies or the Big Bang, etc? My response is that what makes things hard to understand isn't how big they are, but how complicated they are. There's a real sense in which galaxies and the Big Bang and stars are quite simple things. They don't have the same intricate layer upon layer of structure that an insect does, for instance. And so the task of understanding the complexities of life is in some respects more daunting than the challenge of understanding our Big Bang and of understanding the micro-world of atoms, as challenging as they are too. It's rather interesting that the most complicated thing to develop in the universe, namely human beings, are in a well-defined sense midway between atoms and stars. It would take about as many human bodies to make up the mass of the sun as there are atoms in each of us. That's a surprisingly precise statement: the geometric mean of the mass of a proton and the mass of the sun, is about 55 kilograms—not far off the mass of an average person. It's surprising that this is such a close coincidence, but it's not surprising that the most complicated things are on this intermediate scale between cosmos and micro world. Anything complicated has to be made of huge numbers of atoms with many layers of structures: it's got to be very very big compared to an atom. On the other hand there's a limit because any structure that gets too big is crushed by gravity. You couldn't have a creature a mile high on the earth—even Galileo realized that. And something as big as a star or a planet is completely molded by gravity and no internal structures survive, so it's clear that complexity exists on this intermediate scale. Looking forward to the next decade I expect development of the fundamental understanding of the Big Bang, I expect development in understanding the emergence and structure of the universe, using computer simulation observation, and I expect at least the beginnings of an integration between computer simulations, observations and biological thought in the quest to understand how planets formed and how they developed biospheres. Cosmology has remained lively, and the focus my interest. It's not only developing fast, and of fundamental importance, but it's also one which has a positive and non-threatening public image. That makes it different from other high-profile sciences like genetics and nuclear science, about which there's public ambivalence. It's also one in which there is wide public interest. I'd derive less satisfaction from my research if I could only talk to a few fellow specialists about it. It's a bonus that there is a wide public which is interested in origins. Just as Darwinism has been since the 19th century, cosmology and fundamental physics are now part of public culture. Darwin tried to understand how life evolved on this earth. I and other cosmologists try to set the entire earth into cosmic context—to trace the origin of the atoms that make it up, right back to a simple beginning in the Big Bang. There's public interest in how things began, was there a beginning, will the universe have an end, and so forth. It's good for us as researchers to address a wider public. It makes us realize what the big questions are. What I mean by this is that in science the right methodology is often to focus on a piece of the problem which you think you can solve. It's only cranks who try to solve the big problems at one go. If you ask a scientist what they're doing, they won't say trying to cure cancer or trying to understand the universe; they'll point at something very specific, progress is made by solving bite-sized problems one at a time. But the occupational risk for scientists is that even though that's the right methodology, they sometimes lose sight of the big picture. Members of a lay audience always ask the big questions, the important questions, and that helps us to remember that our piecemeal efforts are only worthwhile insofar as they're steps towards answering those big questions.